A series of combos and boxing techniques to help you setup your left hook. Many boxers know how to throw a great left hook but for some reason never learned how to set it up. Read on to learn how throw dangerous left hooks without getting countered. 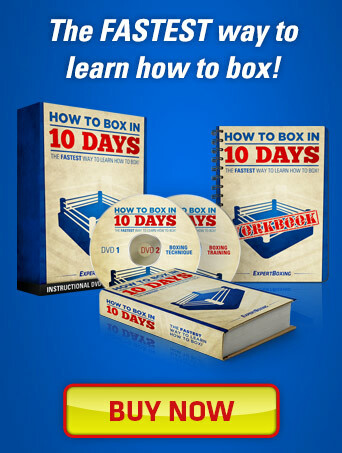 Below are a list of boxing tricks and punch combinations for you to try. They’re all ring-tested for maximum assurance. 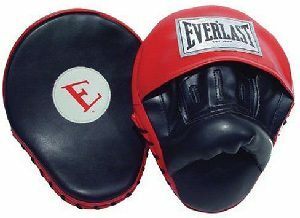 Practice on the bag to get the rhythm and then slow-spar in the ring to get use to throwing them in an effective rhythm. Some fighters like to throw on a perfect beat while other boxers like to fight on an offbeat to catch their opponent when they least expect it. Either way try everything below and let me know what worked for you! Good luck! Jab first, then slip left outside of the opponent’s right hand counter, and throw a hard left hook to the body or the head. If you’re being chased, just reverse the last combo: do a retreating jab (like a jab with a backstep instead of a frontstep), and then step and slip left, and then throw a counter left hook to his head or body. Throw a left hook after any right uppercut. The right uppercut picks up his head, the left hook knocks it sideways. Throw 2 left hooks. Throw a quick light one to the body, and then throw a big one upstairs. The first one could even be just a fake or just barely touch his elbow. Or you can also try a left hook and then do the 1st combo listed above. When you are being overwhelmed along the ropes or your opponent is overly aggressive, you can bend at the waist and lean down so that your head is pointed somewhat in his direction and then using your back as a spring, you quickly pop up and throwing a lunging left hook. This is a great knockout counter. Be careful that you don’t get countered yourself. Use angles. A left hook doesn’t always have to be parallel to the ground. Throw it at a weird diagonal angle so it’s kind of a left hook but also kind of an uppercut. Don’t always aim for the head and ribs, try the solar plexus or the chest. If your opponent moves a lot, aim for his shoulders or his fist if he likes to duck forward a lot. Aim for the other boxer’s gloves. A left hook is dangerous and the damage can be felt through the gloves. You might even be able to make him stab himself in the eye with his own glove and give you more time to punch him. Many people don’t throw the left hook because they are afraid of getting countered by the right hand. If you ever want to become a great boxer, you must be able to do what I like to call “Overcoming the Left-Hook Right-Cross Stalemate”. There are several ways to throw a left hook without getting countered. The easiest way to throw a left hook without getting countered is to throw it shorter to stop it from over-rotating. Too many boxers like to throw a left hook that goes “through” their opponent. What happens is that if they miss, they over-rotate their body and leave themselves open to a counter. What you do instead is just stop the hook at where it would have stopped anyway. This also makes for snappier left hooks but we’ll leave that for another article. The next way to throw a left hook without getting countered is to learn how to throwing a pivoting left hook. In other words, your feet do not stay in one place when you throw that left hook. Instead, your body turns clockwise as your spin on your left foot. Your right foot is sweeping behind you as your whole body turns with the hook. What this does is allow you to left hook your opponent but if he throws the right hand at you, it will pass right through you. What many fighters will do is throw a hard left hook to the body and then throw a pivoting left hook to the head so that they’re safe from their opponent’s counters. Watch Miguel Cotto! Study his fights and see how he manages to get away throwing multiple left hooks without getting countered! Copy his foot movement, timing, and overall body movement. 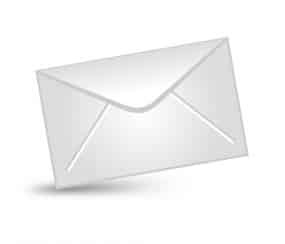 hey i emailed you earlier.I realy like the idea of whipping the punch since im south paw and it will give it more range.Also becouse it doesn’t rotate my body as much,which then brings me to the pivot left hook.Will it work if its being thrown from a south paw position? The pivot left hook is definitely meant for a right-hander. If you are a southpaw what you can do instead is step to your left as you slap down your opponent’s right-hand punch and then throw a left hook or even a straight left. In order, it’s a quick step to the left as you slap away his punch with your left hand. As soon as your left foot hits the ground, you anchored it and throw a big left hand counter-punch. Let me know how that feels. It should feel smooth. Im having trouble with the left hook becouse my left hand is still a bit too weak for my liking.Is being a right handed south paw a good idea?would you recomend it?everyone i run into doesn’t seem to think so but it feels natural to me. Ive been meaning to ask you where i can post my questions on how to improve peripheral vision cos i find that im very vulnerable to the left hook coming from the blind side,ivfe heard thet playing video games helps. Forget about the guides and rules. Rules should be used as guides to help you reach maximum results. If you perform better in a way that goes against the rules, go ahead and use it. 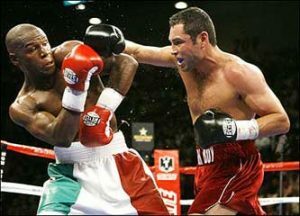 As for being a right-handed southpaw, that’s the same as the common practice of left-handed orthodox fighters – like Oscar De La Hoya is a converted left hander. The advantages are that you’ll have a big left hook (or in your case, a big right hook) and also a very powerful jab. For many people, the “weak” hand is still very useful since it has less muscle and moves faster. In any case, use what works and feels the best and forget about what other boxers tell you. Peripheral vision in boxing has to do with a form of trained reflexes. While playing video games improve your response time, it won’t help your peripheral vision. If anything, video games will train your eye to become even more lazier since you’re always looking in the same spot. The best way for you to overcome your “slow peripheral vision” is to slow-spar. Ask your opponent to move slower to the point where you can train your eye to see the left hooks coming. Once you feel comfortable at the slow speed, start picking up the pace and box at higher speeds. You should stop and slow down if you find yourself getting hit by them again. Practice makes perfect – good luck! Dude you should really tell me where to post my questions cause i got lots. Id like to know when it is a good idea to go for the body and how do you fight a south american style boxer.I live in south africa and whenever a south american fighter comes here he’s always a handfull for our local boxers cause they always come forward with a square stance and seem to be invulnerable to body shots. Very nice information. I have just began training, but I’ve always noticed even since street fights my left hook is very powerful, considering I snapped my left arm clean inhalf when I was a child, and ever since then it’s been my weakest hand. I am a righty so I stand orthodox, but I also like to use my right hand as a jab so I switch to southpaw sometimes. I like the info on the different types of hooks, and I will practice them. Where should I throw most of my left hooks? Wheres the most effectiveness? Face or body? I tend to work the body more than the head but I’ve learned to mix it up more. I just breathe the philosophy, destroy the body and the head dies with it. um so I have a question….. u know how u say that we shouldn’t “punch through” the target. well I have saw video of freddie roach coaching pro boxers and he teaches them to punch through the target. He tells them to follow through with the elbow when throwing a hook. @Anonymous – great question! I have a guide (coming soon) explaining this in full detail but here is the short answer: you want to punch THROUGH the surface of the target but not let yourself over-swing. The moment you know your punch has penetrated, you should prepare for the next punch. If you’re throwing a double hook, then you’ll have to stop it early. If you’re throwing a right cross next, then perhaps swinging it through will load up your right hand. One of my trainers also taught me to throw the boomerang hook. When you swing the hook out, let it swing all the way but once it passes the target, you begin to close your arm so that the hand returns back to your chin (like a boomerang). This way, the hand is still swinging through the target but also returning back to you. Now I have a question about your article on the perfect stance. In the stance that u showed as being the good one (the first one), is the distance between your toes the same as the distance between your heels? In other words, are the feet parallel? It doesn’t seem like it and I don’t think it should be parallel but I wanted to make sure. And also another thing is that, the last stance shown on your article is what I feel like I see most fighters using. Or am I wrong? @Anonymous – you’re correct. The feet are not perfectly parallel. Now this is going to be a very small nitpicky detail but I will explain it if you care to know. The feet may or may not be parallel. If your feet is parallel, it will be for smoother footwork movement, IMO. If the toes are spread wider, that will allow the right foot more room to pivot into a stronger right cross. If the toes are pinched inwards more, that allows the body a more defensive wobble. Bernard Hopkins is a big fan of pointing the toes a little more inwards, he’s a big fan of turning the knees inwards and “protecting your balls”. I do agree with him to some point. Pinching the toes inwards compacts your stance and points your leg strength inwards into each other for more support instead of outwards where you might be more easily pushed off balance. It’s hard to explain but you’ll just have to use whatever feels best for you. The wide stance is definitely more commonly used. And I would advise you not to pay attention to those guys. The wide stance is for the athletic guys that always jump around. Ignore them. 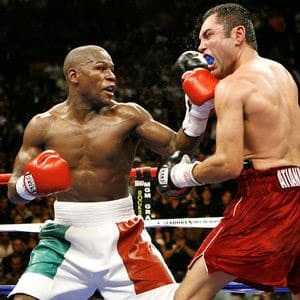 Watch the boxers with great footwork like De La Hoya, Pacquiao, Mayweather, Hopkins. Etc. You will see that their feet are under them more and not spread out so wide. It takes a bit of practice but will help you in mobility. @Johnny N – so for an orthodox stance the front left foot should not be pointed straight ahead but a little to the right? and by widening the stance do u meaning stepping your feet out farther from each other or pointing your toes outward away from each other? @Anonymous – the left foot should be pointed slightly to the right. This way you can step the left foot forward quickly without striking your heel against the ground. And by “widening the stance”, I meant that your feet are stepped out further from each other. @Johnny N – I know u said in your article abut the perfect stance that widening the stance doesn’t give u balance but is it really so? I mean I know exaggerating your stance to much is bad but generally isn’t it that the closer the feet the less the balance? like if my feet are closer than shoulder width, it will be like a upside down pyramid where the base is smaller or closer together than the top, which would be bad for balance. but if my feet are wider, then it will be like a normal pyramid where the base is big and the weight on top is supported and is within the area of the base. aren’t those the reason why when stepping front u move your front feet out/wide first and then drag the back foot in and the opposite when moving back, so that your feet are never close together than like shoulder width? or is it that balance is at peak when the feet are shoulder width apart and balance starts decreasing as we go wider or closer? and btw whats wrong with the heel hitting the ground? bad for the knees? @Anonymous – definitely your feet should not be closer than shoulder width. The perfect width is about slightly wider than shoulder width. While it’s true that spreading your feet much wider can give you a better base but it will affect your mobility. There’s nothing wrong with the heel hitting the ground, many karate practitioners stand with their front foot facing forward. My opinion about facing the front foot straight forward is that it makes your body more square with your opponent as you move around. It also makes your heel strike the ground which slows down the speed at which you can move forward. You will have to experiment moving forwards and backwards and you will see what I mean. @Johnny N – ok now that I think more about it, I think you’re right. Now about lateral or side to side balance and mobility. When I use the “good stance” from your article it feels like I have less lateral balance and slower lateral mobility than maybe I am trying to get. It seems to me that using the third stance (too square) in your perfect stance article gives the most lateral balance and mobility, but I understand that it will make me more square and a larger target area for my opponent. and also, I agree that using that stance, it is a little slower moving front and back. So is there a way to improve lateral balance and mobility without sacrificing balance and mobility front and back or being too square? reason I want to improve lateral balance and mobility is b/c it seems that a left hook is the most likely punch to push me off balance when using the good stance (btw I use orthodox stance). and also it is hardest to regain balance when I lose balance to the left side (my body leaning to the left). idk if I explained it properly. I think it is because since both my heels are pointing more to the left than right and the toes pointing more to the right. so like if I a lean to the right I can push off my right toe and regain balance but if I lean to the left there is only the heels to push off and I don’t that is effective. if I push off my toes when leaning left it will only push me more left. so only way to regain balance on left side is to step out left and sometimes a few steps to fully get balance if I get knocked off balance badly, like even if the left hook lands on my arm or glove and my opponent is powerful I can be pushed to the left and if I don’t step out quick I will lose my balance and will stagger a bit before I regain balance. so how can I fix that? @Anonymous – I think you have to check and see if you’re standing up straight. Also when you punch, make sure you drop your body weight down and not swing your upper body forward into the punch. Your knees should always be slightly bent when you’re standing. It also seems to me like you might be standing with too much weight on your left leg. Try putting more weight onto your back leg and moving around to see if that fixes it. @Anonymous – OOOHHHHHH ok. Sorry for misunderstanding. What you should do is drop your weight (slightly relaxing & bending the knees) as you block the left hook. It may also help to roll your upperbody slightly to the left as you roll with the left hook. I’m a new boxer n I’m having trouble with my left strikes. Hw 2 make it better?????? i love the hook, it can be SO versatile. ortho to ortho, your left hook can be your jab, your body breaker, your one shot KO your combo KO or your accumlation KO. even if its not clean it creates chances. and new guys arent told that in the gyms at least in my days. im glad the internet is there for your newbies with people like you coach. thumbs up. now you wrote everything great in the article, but boxers, if you got a good left hook, opponents will NOT give you once you have a name. this doesnt happen with jabs, or crosses or uppercuts or overhand rights. but theres a special set of moves boxers use to escape the left hook. my comment is about how to counter the defensive stance taken against hook specialists. 4 things kill your chance to throw a hook: a guy always thinking about it, that bloody right glove (i love southpaws) stuck to the chin, a fighter moving to the right and someone who doesnt want to throw their cross. so setting it up means finding a way to not make them think about the hook, to get them to stop move for a second to the right, to get that right glove down. actually that 3rd one includes getting the glove down. bobbers dont escape the set-up left hook. if you want the left hook, you gotta work for it. unless the opponent is a moron and a hands down fighter or crab who isnt roy jones or floyd. so jab with the step in, and fake fake fake. i say keep them busy with the fakes so they HAVE to stop thinking left hook. i know many dont have power but everyone can learn to feint. fake up go down. fake up go up. fake up go down with a hook. mixed in with jabs, if you land a few, you got a guy constantly thinking which of the 5 is he gonna do ? get him to try and beat you to the punch to try and throw over your jab. you got his right hand down moving now. the pivot jab will stop boxers thinking then can just keep going to your right. and you got body shots going which means he needs to defend down as well as up. @cozy – are you having problems throwing them with good techniques? Or problems landing them in real combat? @saber khan – once again, real advice from a true competitor. What about a hook by putting the left arm like a right angle and quickly striking with the hips? is that another way to throw a hook? and is the lunge hook the same as a lead left hook? Hooks are usually thrown with the left arm at a right angle or as close to a right angle as possible. What’s most important is that you hit your opponent with a solid punch. There are so many ways to throw a hook that I couldn’t define outright the different between a lead left hook and a lunging left hook. Both could be the same thing depending on how you throw it. a little addendum J-just checked and on most forums theyre calling every single lunge hook a lead left hook. one can do a lead left going forwards, standing their ground or going backwards (if its the first punch its called the lead hook). the lunging hook means youre back foot has to move forward to punch and you either land on the front foot or turn southpaw due to the turning effect. hi johnny, how I can strengthen my left hook? hey johnny i got a problem. Whenever i hit a 1-2-3 combo the 1-2 land but my opponent keeps stepping backward and out of range for my left hook. He is constantly moving all the time so cant hit him with a left hook and if i lunge in for the left hook he always counters it so that is also not an option. Do u have any advice about what i should do? C’mon now. You can’t treat your opponent like a heavy bag. Different guys are vulnerable to different combos. If your 1-2 lands, try doing a 1-2-1. Or 1-2-1-2b. Or get closer before you throw punches. My advice for you is to stop trying to do something that doesn’t work. Guys that constantly move backwards are not easy to hit with short punches like hooks. JHONNY, WHICH OF THE LEFT HOOK 4 DANNY GARCIA LAUNCHES?